Students get their first exposure to concepts/material during lecture. Using the textbook or class notes and completing homework assignments, they practice the material. Students take quizzes and exams to demonstrate their understanding of what they learned. In most STEM fields, understanding is tightly connected to being able to apply content knowledge and skills in various concrete situations, and the traditional model rarely provides sufficient coaching and feedback in this regard. Instead, students are typically expected to be able to apply knowledge in diverse situations by going to lectures and by working out homework problems on their own in an unsupervised environment. The instructor rarely knows if students are practicing appropriate knowledge and skills while solving problems and cannot correct unproductive approaches to problem solving or coach students as they practice applying relevant knowledge and skills in diverse situations. Lectures are moved to out of class so that in-class time can be used to provide students support and feedback as they practice applying knowledge in new situations and develop problem solving, reasoning and higher order thinking skills. An effective flipped classroom is based on the cognitive apprenticeship model of learning which includes modeling or demonstrating the criteria for good performance, providing coaching and scaffolding support to students as they learn to apply knowledge in different contexts and develop useful skills and then reducing the support as students develop self-reliance. In the traditional model, coaching is very limited or non-existent and instructors demonstrate criteria of good performance in class and all practice by students is unguided and outside of class with minimal feedback. In the flipped classroom model, the lecture is relegated to outside of the class and class time is devoted to coaching students and providing appropriate guidance and support. Also, in Bloom’s Taxonomy, which is a taxonomy of levels of cognitive achievement, comprehension is a lower level of cognitive achievement than being able to apply knowledge in diverse situations or being able to analyze and synthesize problem solutions involving different knowledge elements. Students need more coaching in learning to apply knowledge in diverse situations and in learning to organize their knowledge into a coherent structure. Students watch lectures (either developed by the instructor, or from free or other online sources) and/or read instructional materials (book sections, handouts etc.) before they come to class. Often, students answer questions about what they learned, either by taking short online quizzes before coming to class or at the beginning of each class or both. Class time is reserved for group activities that foster student collaboration and require application, analysis, evaluation and synthesis of the material learned outside of class. Students working together can learn a lot from each other. Students who have recently understood how to apply various concepts to different contexts can guide other students. Articulating one's own ideas to peers helps solidify understanding. In addition, students can co-construct knowledge, that is, students working together can achieve more than the sum of their individual efforts. In one study (Singh 2005 – see below for reference), two students who each has answered a question incorrectly (in the previous week), when working together, answer the question correctly. The group activities communicate to students what the instructor expects them to know and be able to do. In addition, students get feedback from the instructor and TAs, as well as from each other about their understanding of the material and can work to repair their knowledge early (as opposed to for example, after the first test, when the class has moved on to new material). The instructor (and perhaps undergraduate and/or graduate teaching assistants helping with the in-class instruction in a flipped class) can observe how students are applying new knowledge and provide coaching and feedback to help students acquire knowledge and develop useful skills consistent with the goals of the course. It is a good idea to turn the flipped classes into Just in Time Teaching (JITT) classes by asking students to submit answers to some conceptual questions based upon their out of class work on the course web before the class (it can include a question about what was the most challenging thing about the lecture videos). Then, the class can be structured to address those things that are challenging for most students. The Engineering Education Research Center at University of Pittsburgh has been supporting efforts to flip introductory engineering courses during the past few years. More information here. L. Deslauriers, Ellen Schelew, and C. Wieman, Improved Learning in a Large-Enrollment Physics Class, Science 332(6031), 862-864 (2011). 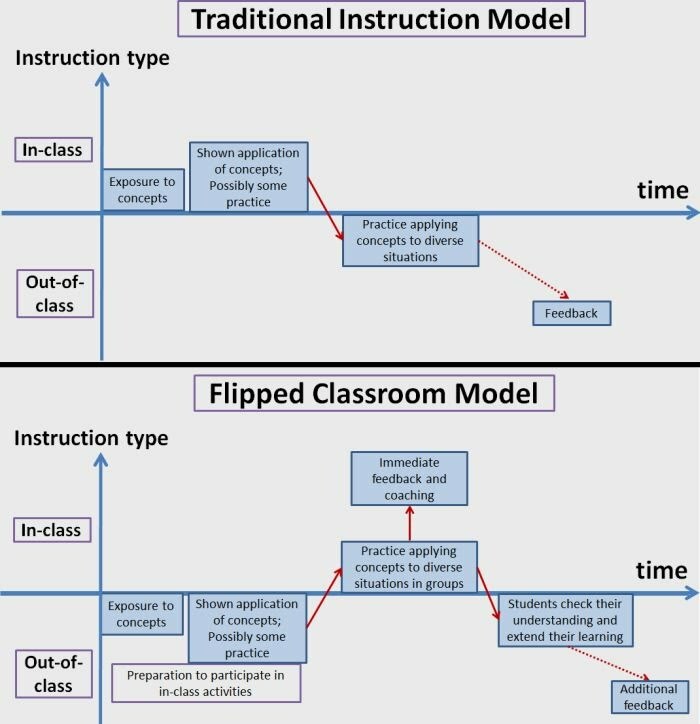 R. Leicht, S. Zappe, T. Litzinger, and J. Messner, Employing the classroom flip to move "lecture" out of the classroom, Journal of Applications and Practices in Engineering Education, 3(1) (2012). J. Strayer, How learning in an inverted classroom influences cooperation, innovation and task orientation, Learning Environments Research, 15(2), 171-193 (2012). S. Zappe, R. Leicht, J. Messner, T. Litzinger, and H. Lee, "Flipping" the classroom to explore active learning in a large undergraduate course, Proceedings of the ASEE Annual Conference and Exposition, Austin, TX (2009). J. Bergmann, and A. Sams, Flip your classroom: Reach every student in every class every day, Eugene, OR: International Society for Technology in Education (2012). A. Kaw and M. Hess, Comparing Effectiveness of Instructional Delivery Modalities in an Engineering Course, Int. J. Engng. Ed. 23(3), 508-516 (2007). C. Singh, Impact of peer interaction on conceptual test performance, Am. J. Phys. 73(5), 446-451 (2005). N. Lasry, M. Dugdale, and E. Charles, Just in Time to Flip Your Classroom, Phys. Teach. 22, 34-37 (2014). P. Heller, R. Keith and S. Anderson, Teaching problem solving through cooperative grouping. Part I: Group versus individual problem solving, Am. J. Phys. 60, 627 (1992). P. Heller and M. Hollabaugh, Teaching problem solving through cooperativegrouping. Part 2: Designing problems andstructuring groups, Am. J. Phys. 60, 637, (1992). N. M. Webb, J. D. Troper, R. Fall, Constructive activity and learning in collaborativesmall groups, J. Ed. Psych. 87, 406-423 (1995). A. T. Lumpe and J. R. Staver, Peer collaboration and concept development: Learning about photosynthesis, J. Res. Sci. Teach. 32, 71-98 (1995). M. Baker and K. Bielaczyc, Missed opportunities for learning in collaborative problem-solving interactions, in Proceed. of AI and Ed. Conference, 210-217 (1995). E. Alexopoulou, R. Driver, Small-group discussion in physics: Peer interaction modes in pairs and fours, J. Res. Sci. Teach. 33, 1099-1114 (1996). T. Okada and H. A. Simon, Collaborative Discovery in a Scientific domain, Cognitive Science, 21 (2), 109-146 (1997). E. B. Coleman, Using explanatory knowledge during collaborative problem solving in science, J. Learning Sci. 7 (3&4), 387-427 (1998). A. King, A. Staffieri and A. Adelgais, Mutual peer tutoring: Effects of Structuring tutorial interaction to scaffold peer learning, J. Ed. Psych. 90, 134-152 (1998). P. Dillenbourg, What do you mean by collaborative learning?, in P. Dillenburgh ed., Collaborative learning: Cognitive and computational approaches, Oxford: Pergamon, 1-19 (1999). B. Y. White, T. A. Shimoda, J. R. Frederiksen, Enabling students to constructtheories of collaborative inquiry and reflective learning: Computer support formetacognitive development, Int. J. Artificial Int. in Ed., 10, 151-182 (1999). K. Hogan, B. Nastasi, M. Pressley, Discourse patterns and collaborative scientific reasoning in peer and teacher-guided discussions, Cognition and Instruction 17(4), 379-432 (2000). C. van Boxtel, J. van der Linden, G. Kanselaar, Collaborative learning tasks and the elaboration of conceptual knowledge, Learning and Instruction, 10, 311-330 (2000). B. Barron, Achieving coordination in collaborative problem-solving group, J. Learning Sci., 9 (4), 403-436 (2000). A. King, Facilitating Elaborative LearningThrough Guided Student-Generated Questioning, Educational Psychologist 27(1), 111-126 (2010). D. W. Johnson, R. T. Johnson, M. B. Stanne, Impact of goal and resource interdependenceon problem-solving success, J. Social. Psych., 129 (5) 621-629 (2010).